Spring pastels and lighter shades are definitely one of the things I most look forward to when Spring comes around. It's the time of year that I always give my nail polish collection a clear-out, and it's usually a 'one out - new one in' type of thing. So I decided to put together this post to show you which polishes I'm loving recently, the ones I've worn so far and the shades I can't wait to get on my nails in the weeks to come. This is a very old nail polish from my collection that I actually just re-discovered today. Admittedly, I do get stuck in a rut at times, wearing just solid colour nail polish - mainly because it's easy to apply and easy to remove. This holographic polish is great because it gives quite a different look to your nails without the pain of removing glitter nail polish. This polish does look slightly more like a glitter in the photo than it does in person, but it's still 'different' if you're wanting to switch from regular nail polish. The one thing I will say about the holographic polishes from Topshop is that they do tend to chip and the lasting power isn't great. But for a night or two, it's perfect! Last Saturday I headed over to Boots with the intention of picking up a polish this shade of pink as the polishes I already owned had started to go a bit thick and gloopy. I had seen the 'Quick Dry' Barry M polishes all over Instagram and had kept a mental note of the checked top so that I'd remember to buy some. I can honestly say that this polish is probably one of, if not the best formula of nail polish I've ever tried. It is very long-lasting and is completely dry within a few minutes. I'm definitely kicking myself now for not picking up more shades when they were on 3 for 2! P.S. the silver studs are from Ebay. I haven't worn the Essie 'Serial Shopper' or Topshop 'Worlds End' shades yet, although I'll definitely post photos on my Instagram within the next few weeks. 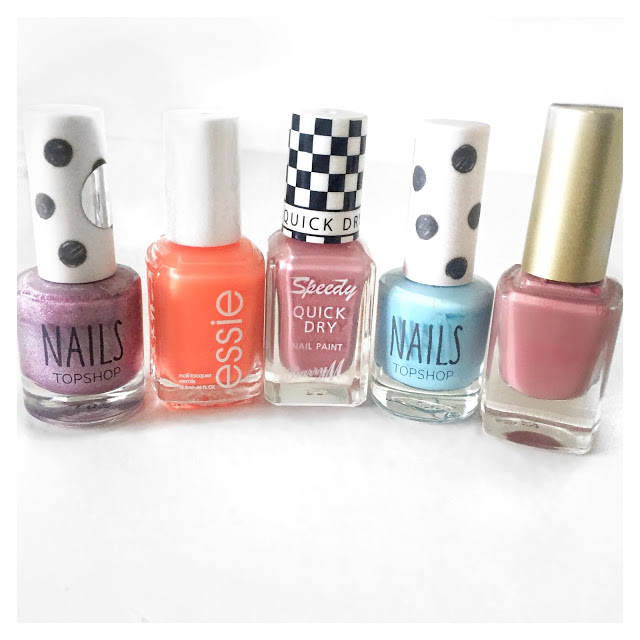 They're definitely the most 'out there' shades of the polishes I've shown so I'm looking forward to adding a bit of bright colour to my nails very soon.